This year, Lollapalooza celebrates its 25th anniversary as a music festival. It’s had some ups and downs, including a couple of years when it went away entirely, but since settling down in Chicago back in 2005 things have been smooth sailing. Things have expanded exponentially in the last decade alone, with more stages, more artists and now more days than ever before. Yes, for the first time ever (and in celebration of this milestone), we’ll have four full days of music and mayhem. If three days and 130 artists somehow wasn’t enough to make your head spin, four days and 170 artists practically crosses the line between enjoyment and punishment. I’ve nearly killed myself in the past attempting to cover every single day of this festival for the last 11 years, and in all honesty I’m quite concerned with how I’m going to survive year 12. Don’t overextend yourself, drink lots of water, and wear comfortable shoes are just a few pieces of advice I can offer and will be abiding by myself. That said, with four days of music it gives you an even greater opportunity to enjoy some of your favorite bands and discover some great new ones. Instead of analyzing every artist on the lineup, or even taking an hour-by-hour look at the insane schedule, let’s try something a little more sensible and manageable for 2016. 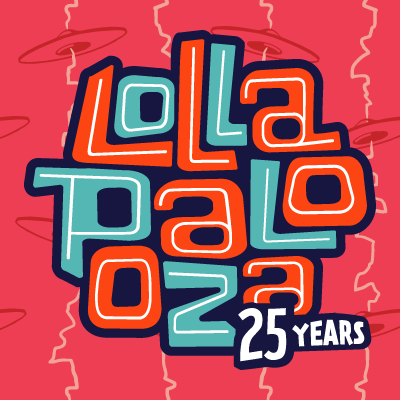 In honor of 25 years of Lollapalooza, I’m going to recommend 25 can’t-miss artists who will be performing at the festival this weekend. They’re broken down by day, and distributed evenly across the weekend with the exception of Sunday, which has one extra artist just to hit that magic number. The only downside in limiting this to recommending six (or seven) artists per day is that a few really cool acts inevitably get left out. If you’re going all four days it’ll be tough to catch everything worthwhile as it is. The way these picks are structured, there’s not a lot of time slot conflicts happening, so you could theoretically see just about all of these artists if you play your cards right. Join me after the jump for the full list of 25, complete with multiple audio/video streams from each. Best of luck to you if you’ll be in Grant Park this weekend. I’ll see you on the battlefield. Follow my Twitter and Instagram feeds for live, on-the-ground reports all four days. One day down, two left to go. The start of the 2016 Pitchfork Music Festival was plagued with a light rain shower, followed by gray clouds that seemed somewhat ominous for the rest of the day. Thankfully it was a largely dry day, and the music was sunny enough that the skies didn’t matter so much. I’ll have all kinds of photos and other goodies once the weekend wraps up, but in the meantime please join me after the jump for a brief recap of everything I saw and did on Friday. 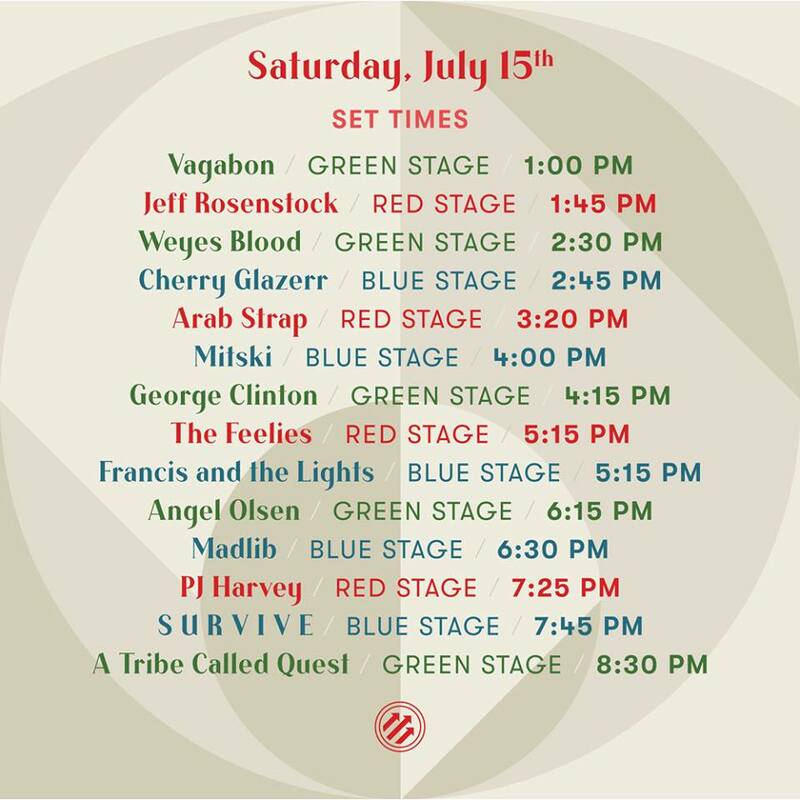 Sunday at Pitchfork Music Festival is set to be just about the sexiest day of any music festival ever. To quote Tracy Morgan, “Somebody’s gonna get pregnant!” The lineup is stacked with all kinds of R&B and freeform jazz that’s designed to put you in the mood for some lovin’. Not sure how perfectly that pairs with sun and 85 degree temperatures, but we’ll find out, right? At least things will be steamy one way or another. If you’ve been to the fest for two days already, the generally slower and more relaxed vibe on Sunday should be a nice change of pace. The slightly later start time than usual is an added benefit. Gates may open at noon, but the first music doesn’t start until 1:45, so sleep in an extra 90 minutes or at the very least stay off your feet for that period of time. As with the other two days though, there are some serious benefits to showing up early and catching those first bands of the day. Join me past the jump for the hour-by-hour breakdown of who’s playing when, and what artists you simply can’t miss. 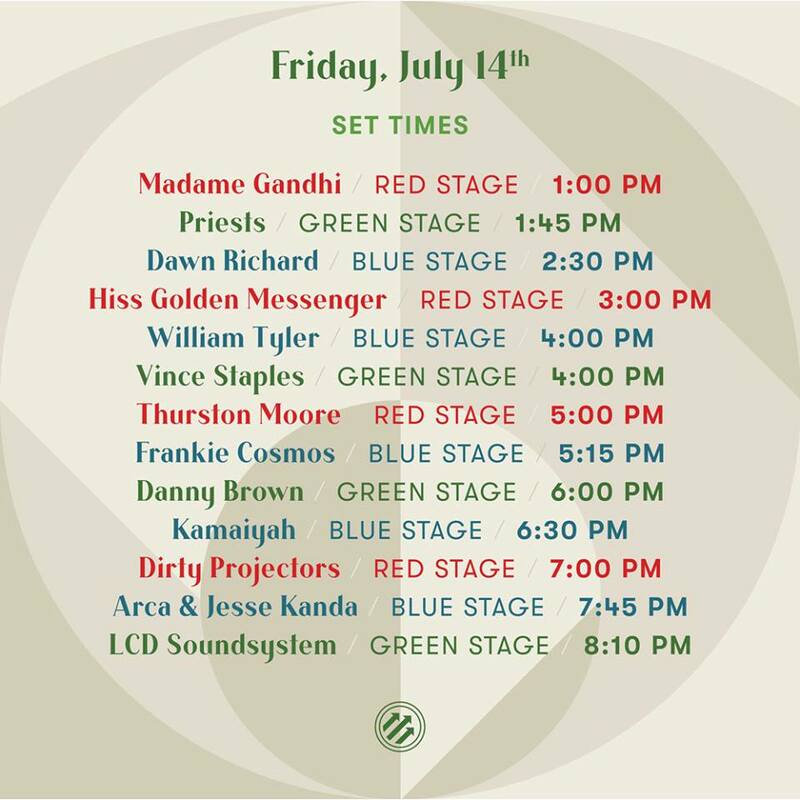 Also, in case you missed them, here are the Preview Guides for Friday and Saturday as well as audio streams from every artist on the lineup. Thanks for reading. 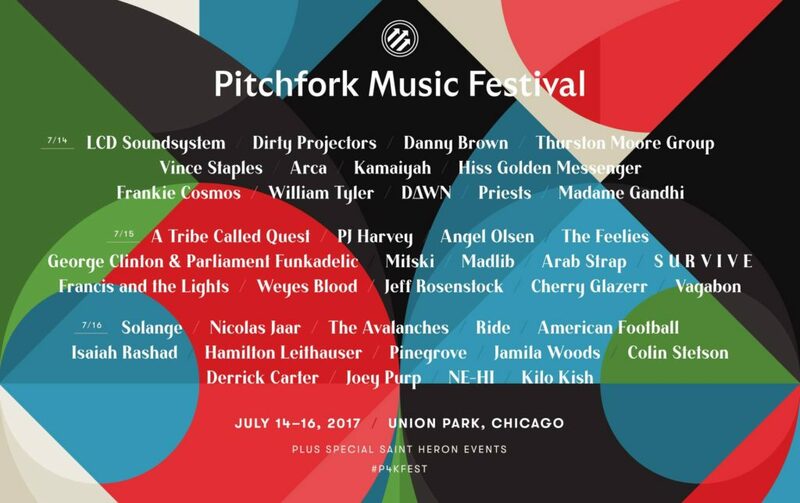 If you’re headed to Pitchfork this weekend, I’ll see you in Union Park! Let me use today’s introduction to offer a few festival tips and tricks to help you survive the weekend at Pitchfork Music Festival. Six years of coverage has helped me get this down to a science, so if you follow my lead I guarantee everything’s gonna turn out great for you (you know, within reason). First, the general outdoor festival stuff. Stay hydrated. Drink at least 3-4 full bottles of water each day. That is a minimum. I know it’s tempting to have a few beers, and you realistically still can, just don’t make that the only liquid you drink all day. You’ll sweat tons in the 80+ degree heat and will be on your feet pretty much all day, so those fluids need to be replenished unless you want to wind up in the medical tent. Next up, sunscreen and bug spray. Use both liberally. If you get sunburned on Friday, the rest of the weekend will be painful. You also don’t want to scratch a bunch of bug bites either, so protect yourself. Don’t overexert yourself. There’s a temptation to go hard and try to see just about every band. It’s possible too! Union Park isn’t that big, and with three stages you won’t need to do that much walking. Just remember to take breaks and sit down from time to time. Eat food – probably more than you’d otherwise have – to maintan energy while you burn calories. Explore! There’s plenty of fun things to do, including the CHIRP Record Fair, the Flatstock poster sale, Book Fort, Craft Fair and Kids Area. A bunch of brands have tents/booths where free food and merch is given away. Lifeway frozen kefir bars are typically being given away near the basketball court, so that’s a nice cool treat on a warm day. You can probably screen print a t-shirt for free too, if that’s an interest. If you’ve got some down time or don’t like any of the artists performing, wandering around the festival grounds can make for a great time. So that’s about all I’ve got in terms of tips. Well one more – be good to others! In my experience, everyone at Pitchfork is very chilled out and friendly, so treat them in kind. Join me past the jump for an in-depth, hour-by-hour look at the schedule for Saturday. There’s plenty of great stuff to recommend. Also, in case you missed them, here are the preview guides Friday and Sunday as well as audio streams from every artist on the lineup. So you’re planning to attend the 2016 Pitchfork Music Festival. Congratulations! You have made a very wise choice. It promises to be a great time in a great city with a great collection of artists. Speaking of those artists, one of the challenges with any music festival is looking over the schedule and trying to figure out who to see when. In the cases where you only like one artist performing at a particular time, the choice is easy. In the cases where you like two artists performing at the same time, the conflict can be tragic. But what about the artists you’re not familiar with? There’s always at least a few at any large festival, and even the most avid music fan has some knowledge gaps. The great news is that it’s easy to learn, and maybe just a little easier to make a crucial decision about a conflict, if you’ve got some outside help. Welcome to the first of three installments of the 2016 Pitchfork Music Festival Preview Guide! Here you can find out information about every artist on the lineup, and see recommendations on who you should be seeing at any particular time. So if you wouldn’t mind, please join me after the jump to check out the comprehensive guide to who’s performing on Friday. Let’s go! Check out the preview guides for Saturday and Sunday as well as audio streams for every artist on the lineup. Are you prepared for three days of music madness right in the heart of downtown Chicago? Yeah, me neither. Every year Lollapalooza starts out so promising, the sense of excitement palpable in the air as you walk onto the grounds of Grant Park. But if you take this music festival seriously, and you should, then by Sunday night you’ll be about ready to collapse, practically wishing for the sweet embrace of death. It sounds terrible and in many ways it is at the time, but once you’ve had a couple days to recover only the fondest of memories will remain. You’ll have seen many of your favorite artists perform, and might have even been introduced to a few new ones along the way. You’ll have eaten some delicious food, sipped some delicious drinks, spent quality time with friends and maybe even made a new friend or two as well. There’s so much to be gained from the pain and punishment we put our bodies through at this festival, especially walking back and forth from one end of the park to the other. If you play it right so you’re not running all over the place, and you’re cool with sitting down and taking a breather a couple times each day, the experience actually becomes quite pleasant. So beyond tips to minimize walking, I’ll also say to wear plenty of sunscreen and drink plenty of water. That’s just a rule of thumb for life in general actually. But what about the music? Sure, you know at least a handful of artists playing each day of the festival, but there’s likely to be times where either you’ll be clueless about who you should see or two (maybe even three) of your favorites are all on at once and choosing between them seems too difficult. Fear not, loyal reader! I’m here to help. After the jump you’ll find an advice guide recommending artists worth seeing every hour of every day, all weekend long. You’d have to be some sort of superhuman to see all of these sets, but if you’re smart and economical enough you can catch most of them and wind up having a spectacular time. So enough with the chit-chat, let’s dive right in. Brace yourselves, this is going to be a bumpy ride. Join me after the jump for a collection of photos that I took on Day 3 (Sunday) of this year’s Pitchfork Music Festival. Photos are arranged by set time. They are also available in higher resolution on Facebook. Check out my full recap of the day, as well as all the rest of the coverage, by going here. Join me after the jump for a collection of photos that I took on Day 2 (Saturday) of this year’s Pitchfork Music Festival. Photos are arranged by set time. They are also available in higher resolution on Facebook. Check out my full recap of the day, as well as all the rest of the coverage, by going here. Join me after the jump for a collection of photos that I took on Day 1 (Friday) of this year’s Pitchfork Music Festival. Photos are arranged by set time. They are also available in higher resolution on Facebook. Check out my full recap of the day, as well as all the rest of the coverage, by going here.